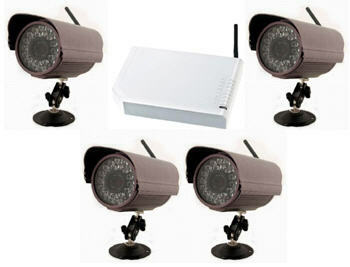 Four (4) Weatherproof (with temp range -10 ~ +50°C) Wireless CCD Camera Kit with l Wireless Quad view / Split Screen Receiver - 500 meter Range. Open linear transmission distance of 500M. 2.4GHz locked frequency transmitter and receiver. The four CCD cameras have internal microphones and night vision distance of 30 - 50M, the wireless receiver supports single view, quad view and picture in picture and can be remote controlled, and can be connected to a TV, monitor or LCD TV for image monitoring. This wireless camera kit is ideal for monitoring activity outdoors as well as indoors, car parks, play areas, outdoor swimming pools, barns warehouses, offices and children's play areas because of the long 500M transmission distance.